Club Penguin Cheats by Mimo777 Club Penguin Cheats by Mimo777: Club Penguin Puffle Rescue Is Here! Sweet! The new Club Penguin game, Puffle Rescue is finally here! When you go to the Mine click on the Bulletin board to the left of the Cave opening. 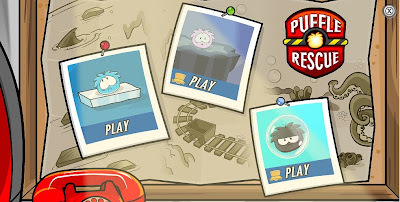 Puffle Rescue has 3 different game choices! You get to choose to rescue the blue puffles, pink puffles or black puffles! The blue puffle rescue can be played by anyone, but the pink and black puffle rescue games can only be played by members! Bummer! Check out what it says when you save a puffle. How nice! Oh yeah, the Caves are now open again! When you are in the Cave, you can find coins if you dig in the "chocolate pudding." If you don't already have one, you can get a free helmet to the left of the pudding pond hanging on the corner of the wood thingy. Sweet! Let me know how you are liking the new game, k? There is a glitch in the game. 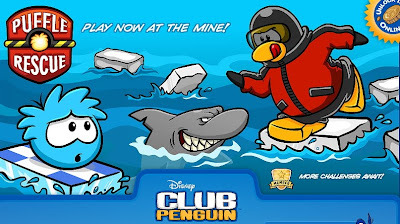 The flag sends a signal and then you penguin go through the water really fast and then you loose a life. I can't play the game know because of it. This is the best game ever and if you follow the shadow on the black puffle one you will get a key pin! it is so cool! The momments we all have been waiting for. And was that the cute blue, cool black, and furry pink I saw there? Shame you can't rescue the other puffles. Sweet mimo! Ive been waiting and im actually glad im sick so i get to play the game. hi everyone! the game is soo awsome... you have to try it! 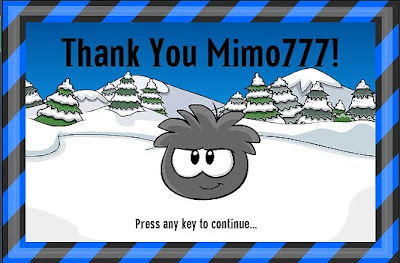 i wonder how you get the secret room though, hmmmm.. tricky, anyways i love mimos site it rocks! hey mimo how can u get the key?? How to get to that secret room? Hey i found out that if you go to the FIRST underwater level and if you follow the squid(go over his bubbles) you will arrive at a BIG piece of stone there is a door to the underwater level (the room that is locked) and there is a pin there that unlocks the door. The new game is so fun! I know how to get in the room! Step 6 = Enter the secret area which actually just takes you out of the game and into the room. Step 8 = You can now access the room when you want! well its really hard Mimo. do you think you could post some cheats on how to get the key? i got up to level 9 in black puffle rescue if you want some screenshots. MIMO I GOT THE KEY! When u go on black puffle, follow the squid shadow and make sure u hit the bubbles! Mimo in order to get in to the Secret water place you must land on the bubbles that the giant octopus lets loose and eventually you will get to the end where there will be green coral. Jump on the coral by (bubbles) and then there will be stairs. Once you get in to the room you must get the moss key then you will always be able to get there. hmmm, where do we get the key? 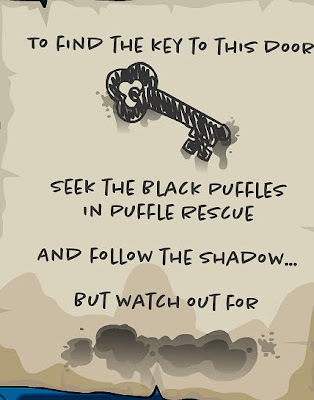 it says follow the shadow while saving black puffles. what does that mean? Hey mimo theres a new pin in the underwater room! all you have to do is follow the squid! Hey Mimo! In the black puffle level follow the squid shadow and float on its bubbles. Then it will take you to some land to get into the entrance! A key pin is in the under water cave. The blue puffle music sounds like pirates of the carribean. 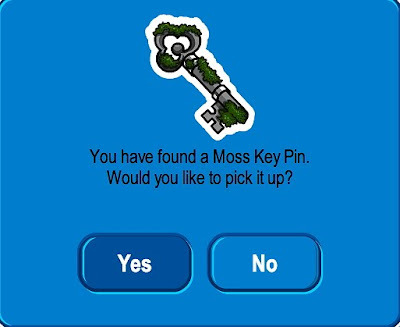 Also mimo when you have found the secret entrance to the black puffle you can get to the underwater room and get the moss key. THIS GAME ROCKS! im playing it right now! i just passed level 2 on the blue puffle. i mean for members only! Kkkkkk123 (CPG MOD) Yeh not really go cpg12 right now as I don't have many friends right now...Get it? That is unfortunate...It's good to see you had a go though! Kkkkkk123 (CPG MOD) Like I said in the other one...Don't have many friends right now!! MIMO IM SORRY ABOUT THE CAPS LOCK I JUST HAVE, BUT YOU GOTTA SHOW A WAY ON HOW TO GET THE MOSS KEY!!! Everyone here in the cave is confused at the time. I have already tryed to help 20 or more people. Its not that hard to get. Follow the shadow at the first level and jump on the bubbles. Thyanks for telling us all because now many people will be able to get it!! Thank you! Mimo I have just tried to Mod...A LOT! But I can't do it all the time...I hope you understand! i cant do it!!! i just don't really get it. Use the bubbles to go up! I got to level 12 on the black puffle then died. I love the black puffle levels. The pink puffle is hard. You can't even see anything. And the blue is ok but black is the best. When I digging in the ground I got 1 coin 5 coins 10 coins and then 50 coins at once! Thats so hard to get I think. WELL HARLY HE CANT JUST GET CHEATS STRAIGHT AWAY CAN HE LOL ITS ONLY CAME OUT FOR LIKE A MINUTE! SO DONT PRESUREISE HIM LOL. i cant do it! i cant get the key. i don't get it when they say "follow the shadow" and "jump on the bubbles". mimo you should make a walkthrough video because i just don't understand that well. please make a walkthrough video! it dosent give alot of money.. I just played 2 levels of the blue puffle and is actually really fun. So the black puffle and blue puffle are super fun but the pink is impossible. Hey mimo, here is how u get the key. after reaching the biack puffle on the 1st stage, follow the squid shadow while collectting air bubbles. u will reach a green coral place. swim to the blue platform at the end of the path. then goright torwards the wall. 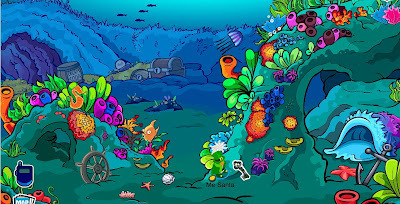 you can walk through the wall of coral, and reach the secret stairway that leads to the under water room where the key is! free helmets by the entrance of the pit that u dig!!!!!!!!! Ya, I know! It's really annoying isn't it. I'm sure club penguin will notice and fix it soon! First, go into the game. Then select the black puffle. In level 1, go get the black puffle but don't bring him back to the start. Wait for the squid to swim under you, and then jump on the bubbles that come after it. It takes a few tries but with a bit of practice, you should find the secret entrance! Then you will be in the underwater room, where the key is sitting on the ground! You have to be a member to play the black puffle rounds, though. How do u bounce into them??? First, go into the cave. Then take off all your clothes. Then put on either JUST THE HARD HAT or JUST THE SHOVEL, and dance! Every few seconds, move around and dig or drill in another spot. make sure you're in the dirt... err umm pudding though! MIMO HELP!!!!!!!! i dont know what shadow to follow PLEASE help soon i really wanna go in tht room but my penguin dies when i follow the squids shadow HELP PLEASE RESPOND!!! Mimo! Cheat alert!! In the caves, right on the wood post you can get the hard hat and drill for free! Please give credit! Nice job! And dont put "CPG MOD" after your name if you arent modding! Thanks! This is for everyone who is asking how to get the key. Read the post. It has the info on how to get the key! Yay! Finally! HELPFUL HINT FOR NON MEMBERS: there is a FREE mine hat for everyone in the one room with the giant mudpit and snowball powered lights. The hat is by the entrance. AND when you dance you pull out the jackhammer. Sadly, the key is members only. Happy Puffle Rescuing! Lil Man 2k9 it's good that there is a quality button. Weird! CP will probably work out the kinks, just hope it is soon! Purty sweet, isn't it! I can't wait to play it! Mimo, I'm having a green party on March 17! This is my first party and I'd like to have a good turn out. It's on Icebound at 1:00 PST in my igloo (I just became a member). I'd like people to turn green and bring their green puffles if they can. Please post this! If not, everyone who reads this come, please! I want to have a blast at my first party. I'll open my igloo for everyone. Well, I haven't tried the black puffle game yet, sorry! But it says that you need a key from the black puffle game to get it. I hope this helps some! First, you need to be a member. (If you aren't sorry!) Then you have to go to the black puffle game, and I heard something about following a squid...? Oww, you are hurting our ears! Don't use caps next time, please! And, yes, sadly, it is only for members...Wait, no, you can play it, if it is the blue puffle game! But if it is pink or black, then...That really stinks! Thanks for the awesome tip! I can't wait to play it!...If my arrow keys worked!? No, I'm sure it works. CP needs to squish a few bugs, but the arrow keys on my computer are seriously messed up. Maybe that's it! Sweet! Thanks for the awesome tip! Yeah, really stinks doesn't it? Well I am a member, but I feel bad for all the nons who can't get in. CP is just trying to make them feel bad and unimportant and jealous so they will buy a membership...Well, not that harsh, but it is still unfair! Thanks for the awesome tip, I will be sure to remember! Oh, and don't forget...What? Ooh, I forgot! Oh wait...Yeah, don't put (cpg mod) unless you are Modding, k? I haven't actually played the game for more than 45 seconds, but I have heard this: You follow the squid in the black puffle game by following bubbles. Then it takes you somewhere to get the key! Does that make sense? I hope I helped! Ugh, I hate it when the arrow keys don't work! I haven't played the black puffle game yet, but is it a prob with your arrow keys? Do they take you in the wrong direction when you aren't even moving the keys? That may be it. hey mimo they changed the dig poster from "wear a hard hat or shovel" to "wear ONLY a hard hat or shovel" weird huh? I have a few things to say: 1. Nice tip! 2. Only put (CPG Mod) when you are Modding! 3. You don't have to use Anonymous! You can use Name/URL. If you don't have a site, that's ok, you can just fill in the name (In your case, AX7Shadow). Or use your Google account if you have one. I hope I was helpful! Lol, really? For some reason, I don't have the volume turned up, so......Yeah! Awesome! I have only played Level 1 on blue puffle, and I didn't pass because the arrow keys are so stupid and won't work! Same for me. Doesn't that tick you off?! First, don't use too many caps you hurt our ears! Second, are you saying you drown and lose a life? I hate that, I think that it is most likely about your arrow keys. They are constantly messing up for a lot of us on CPG, I've noticed! mimo u forgot one thing in the cave where everyone is welcome on the wall there is a mining hat and a drill if you go to it you can get the item!!!! What level do you follow the giant squid on? Hmm...I may be able to come, because it is at 4 for me, and I have school and all that, and I usually get home at around four, usually later, homework...Yeah, I don't think I can make it! I hope tons of people come! I can go to the underwater room! Plus members deserve their own room to keep. I mean i pay a lot of money to be a member so. Mimo i dont get it i got the puffle went ontop of squid and nothin!whats going on help me out im usally on Snow ballif its full im on a less ppl server my name is Book200 0n the srry i cant talk though grrrrrrrrrrrr i blame my parents! Yes i kno it is stupid. How do you jump on the bubbles for the black puffle game? Please please help me! The Puffle Rescue is great!! I got a high score of 26,541 points in the ice place. In the under water room throw a snwball and it becomes a bubble! Omg. I got 1,587 coins in one game of puffle rescue! I got to level 20 on the black puffle. Yeah, I agree. I missed out on a lot of fun when I was a non, and so do a lot of people now. 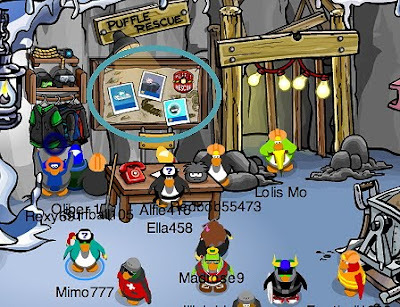 I hope that there will be more rooms for all peeps of CP! Really? Nice tip! And about your hangout...Didn't make it :'( I'll bet it would have been kewl! That's weird. It's because if a penguin is wearing a hard hat and their favorite green hoodie, it won't drill. So they have to wear only the hard hat or shovel. People were probably getting confuzzled! Erm...I just submitted a comment while I was typing in "Hnwjanuary11", and idk what it submitted my comment as, so if you see a comment by me and the name doesn't make sense, it is me, ok?? K, I guess I accidentally clicked Anonymous...Lol Totally spaced out right there thinking about hippos. i cant get it... it is hard to get! i played the new game i got to like the 25th lvl!! how do u jump on squid bubles? Mimo!! U Also Can Dig For Coins IN The Throw wnowballs for power thingy! I got 100 coins! Look closely at the page before you login, the one with the new game on it, it says in small letters 'more challeges await'. I guess it means more puffles are going to be rescued, what do you think. Sorry about that, Hnwjanuary11. I really wanted to meet you on CP. the party is at 4 for me too, but I'm out of school. The party will go to 5 o clock EST, or 2 o CLock PST. Hope that helps! Good job! Mimo already posted this though! On your vid Mimou could go into the secret room. So that means your a member! Its a member only room!!! I don't like the game because it's got boring music and is too hard. i wonder if they will add more puffles.what if its like the dj game.they should add all the puffles. You can get a free mining helmet if you go up to the ones leaning against the wall, in the cave room. lol, pudding pond! i like pudding!